The project for the month was revamping the library, including adding more educational toys and and supplying more shelf space. Librarian Irene and Olive teamed up with Carol Falke from the USA to make this project a success. Big question: What belongs in the classroom and what should be in the library available for teachers to borrow and return? Preschool classrooms also benefited from this project. Organization was the objective in the library and classrooms. Every 3- and 4-year old enjoys dolls that to play with. Cribs are on the way for these baby dolls. Each preschool classroom will have a crib and hopefully two baby dolls. Never too young to learn about love. With 30 kids in the morning and 30 in the afternoon loving on these baby dolls, they will not last long. But, oh, what fun! In the library for all to share. African animals to see and read about. What boy and, yes, girl would not love vehicles of every description? With books to tell the story. Construction in progress. All ages benefit from the library. Space travel, futuristic indeed. Carol demonstrates rocket for teachers. Let's go shopping, Vegetables, fruits, shopping bag, pretend money and a tea set for later. All part of the learning process. Learning about caterpillars and butterflies was the project for the preschool. We cover so many aspects of living and sharing. What challenges will come in 2019? Already accomplished is a second big bus for the primary school. •	Enlarge Hope House for use as worship center. Congregation continues to grow. •	Build four more classrooms for primary school. Possible two-story building. •	Look at the possibility of a secondary school. •	Update our guest house facilities. Changes take place very fast at Urukundo Village. Trying to keep up with new government regulations can be stressful. Removing our sewing school from its present location on the main road into the campus was such a challenge. The move had to be made in three days. The new location was not ready as the funding and building were mainly in the talking stage. Only the retaining wall is in place at the projected location for the sewing school classrooms. The only house large enough for the transition was the present home for boys. Due to government regulations moving children into foster families, the number of boys in the home has been and will continue to be reduced. Moving the boys to a smaller dwelling took place very quickly. Proximity to former boys house on the left and sports fields above. It is a good house, and the boys love the new house. Bringing you, our friends up-to-date on development at the Urukundo Learning Center. You have made this possible. Thank you. Top Level: Preschool, Kindergarten, Culture Center (brown roof), retaining wall site of future classrooms for the technical school for sewing, Cleared, leveled and ready to start building foundation. Water storage reservoir. Second Level: Classrooms for Primary 1, 2, and 3. Third Level: Restrooms for boys and girls. Funded by World Orphans Fund. Red Roof: Teachers Resource Center, Music Center. Fourth Level: Classrooms for Primary 4, 5 and 6. Black water tanks on three levels. The second photo provides a closer look at a portion of the compound. Space and construction begin for four classrooms to move the Sewing Center. The retaining wall indicates where the new classrooms will be constructed. I’m looking forward to when the Sewing Center will be part of this picture. The Sewing Center now is in a rented space which is scheduled to be demolished when a new road is completed. It is urgent we get the center moved into a new building before that happens. In process: Clearing done, Leveling done, Retaining wall built. Need funding for foundation and construction. To construct one classroom costs $25,000, or $100,000 for four built at separate times.. To build four at a time, the cost is less than $75,000. A savings of over $25,000. Our aim is to build at lowest cost for quality work. Would you like to help? Gifts appreciated. 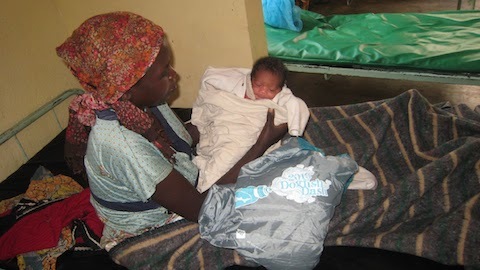 Urukundo’s Mama and Baby Project was so pleased to get a new supply of newborn items from friends in Pennsylvania, USA. They reached us via a suitcase carried by a Rwandan student who was returning home from Penn State University. The items are so needed. We even received hand-knit baby sweaters and hats. So much love! Other wonderful gifts to us are the reusable nylon bags from ChicoBag, which has given us 100 bags each year for the last four years.They are gifts that keep on giving and are used by the mamas after they are home. They serve many purposes. Do you remember the stone path in an article in the March 2012 newsletter? Look it up. It still applies today in March 2018 as it did in 2012. The stone path has grown from five stones to many stones and has been moved to the outside boundary to have enough space. It is a great way to honor contributions to education. Help us continue to provide quality education where it is needed most. 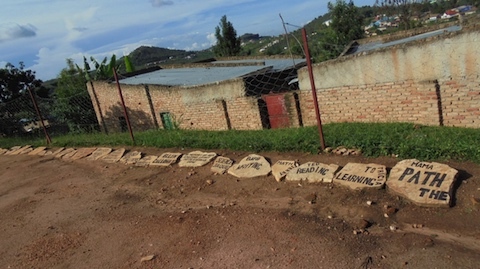 We will build a new path to the secondary school (high school) with your stone and a substantial gift of $1,000 or more for construction of the school. The amount needed for the new high school for more than 700 students is very high ñ US$300,000. 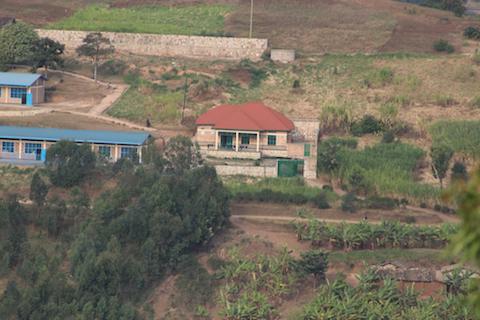 No one church and most individuals cannot afford such a gift, but if all could give what they can afford, it would be a big help in reaching our goal of providing quality education to the vulnerable children in Rwanda. Give from your heart. Help to build the future.